If you or someone you love has been injured in a car accident that involved cell phone use, we are ready to fight for your rights. Distracted driving is a negligent act that may result in serious injury or even death. At our Los Angeles law firm, the Law Offices of Edward Deason, we feel passionate about putting a stop to auto accidents that occur as a result of drivers actively using cell phones, either through phone calls, texts, or accessing the Internet. You may be eligible to receive compensation for your damages and injuries, and we are ready to provide you with the aggressive legal representation you need. If you are the innocent victim of an auto accident as a result of someone else’s distracted driving, you have rights. 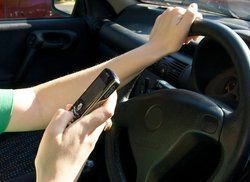 We are dedicated to helping reduce this problem, and taking on your case will help us set the stage for a world in which drivers know they cannot get away with driving while using a cell phone. Even though driving negligently while accessing a smartphone is the other party’s fault, you will need our assistance in proving liability. We have the knowledge and background needed to successfully investigate your accident, so you have the time to heal and recover. Your efficient personal injury lawyer will utilize his extensive experience in auto accident cases to thoroughly review your case and do everything it takes to ensure you recover your damages. Auto accident lawyer Edward Deason will use his over 30 years of legal practice to work aggressively toward obtaining the compensation you deserve for your pain and suffering. Mr. Deason’s reputation for efficient work and extremely high standards of professionalism ensure you will receive the dedicated attention you deserve. After carefully reviewing your case, he will go above and beyond your expectations, working to prove liability, while making sure you receive the full value of your personal injury claim. If you or someone you love has been injured in an auto accident that involved cell phone use, we encourage you to contact us to schedule a consultation immediately. We will thoroughly review your case, and work diligently to ensure you receive your rightful compensation.